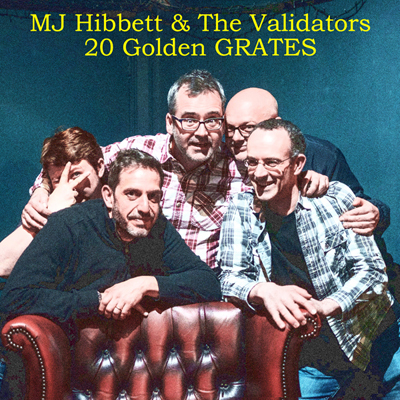 Welcome to webpages of MJ Hibbett, featuring everything that's going on with The Validators, the Fringe shows with Steve, Totally Acoustic, and lots more. Our Christmas album Christmas Selection Box is available to buy from 3 December, either directly from us or via iTunes. Our greatest hits album 20 Golden GRATES is OUT NOW as a limited edition CASSETTE with free download code! The latest news about what we're up to is in our monthly newsletter and almost daily blog. You can read about all the records we've released and find out how to buy them, if you'd like to. We have a bandcamp site where you can live stream most of our albums and download tracks. Catch up with MJ's writing career on his dedicated writing pages. There's links to our futuristic web presence on twitter and facebook. And there's loads of pictures of us and an ever increasing pile of videos to see too! Thanks for coming by, and happy reading!